How cute is this guy! He is a Pomsky Cocker We can't get enough of his darling sweet personality! Georgie such a sweet boy and loves playing and of course exploring! Georgie was born in our home receiving tons of affection and love since the day he was born. He is sweet, loving and loves to snuggle! He has incredible blue eyes (like his dad a Pomsky) and a soft coat like his mom (A Cocker Spaniel)! He has white feet and white markings on his chest. His parents are our personal pets (whom we adore) making him ideal for someone who would love a truly sweet companion. We just can't get enough this cute little guy. 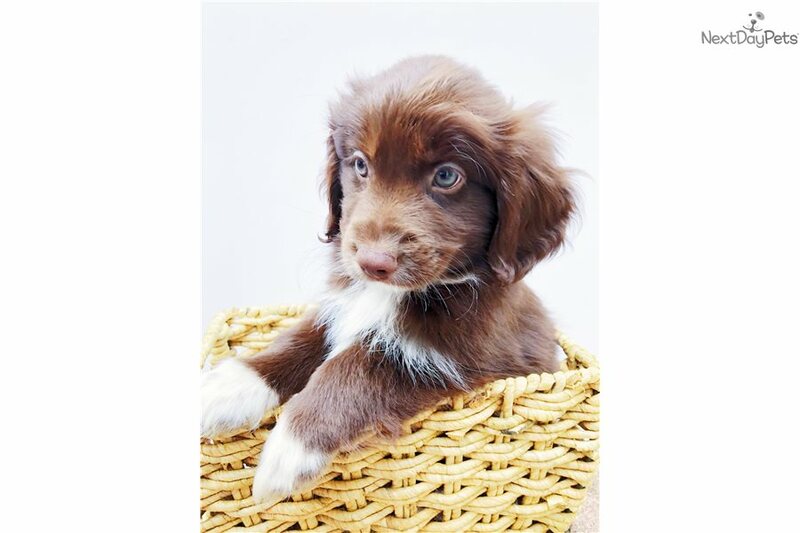 He is a rare breed among Cocker Spaniels because his father is a crystal blue eyed Pomeranian Husky (with pedigree) and his mother is a gorgeous Cocker Spaniel with copper tones (also with a pedigree). His parent are exceptionally healthy and true to each of their breeds. He will weight between 25-30 pounds full grown. Come meet this cutie pie and fall in love with his sweetness! He is now ready for his forever home just in time for the holidays! Come meet this little guy and fall in love! He come with a toy of his very own, a puppy pad, and some of his puppy food to help transition him into his new home! Come meet this little cutie pie and fall in love with our sweet little Georgie!